The B5-F Spectra HD backbox from Pelco comes with a flush mounting, an in-ceiling installation and an aluminum construction for both indoor and outdoor security operations. The B5-F Spectra HD backbox security camera comes with 16 preset tours, a 360 degrees continuous pan, auto tracking/adaptive motion detection, plus a resolution of 1.3 megapixel, and 1280 x 960 pixels. The B5-F Spectra HD surveillance camera also features PoE, dual H.264/scalable MJPEG, 720p @ 30ips, 960p @ 20ips, as well as WDR, and a 1/3” CCD sensor. 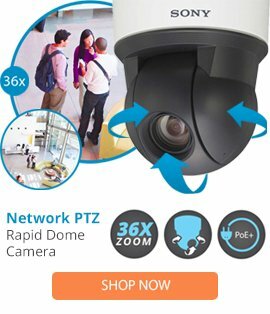 This high grade Spectra security camera also has an ability for monitoring and controlling video over IP network operations, and has been designed for in-ceiling mounting in indoor or outdoor locations.